“Captain Barnacle Garrick was bad natured and horrible, which most pirates would say was good—very good.” But his daughter, Augusta, was not. 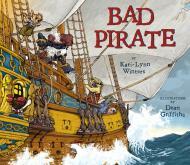 In Bad Pirate, Barnacle tries to teach Augusta to be saucy, bold, and selfish, but she doesn’t seem to have the knack. Alas, she is kind-hearted and helpful, much to Barnacle’s dismay. When a storm threatens the ship, Augusta defies her father and takes bold, selfless action to save the crew, finally winning his admiration and understanding. Discuss what each of these features was used to achieve in the age of large sailing ships. (For more information to lead that discussion, see this child-oriented Pirate Dictionary). For more information on sailing ships of long ago, see this Complete List of Sailing Vessels. Activity 2: What Makes a Good Pirate Captain? List the characteristics the group names. Which attributes are most important to different members of the group discussing the book? Which are important to being a good pirate? Kids can discuss the above while practicing talking like a pirate, using words and phrases from the end pages of the book. Inexpensive pirate props like bandannas can be found online for extra fun, and International Talk-Like-A-Pirate Day (September 19) is a great occasion to read the book and practice speaking pirate! Explain that figureheads are symbolic sculptural decorations that are mounted on the prows of ships and thought to bring good fortune. Discuss how figureheads have served different purposes throughout history, including decoration, symbolism (inspiring crew and frightening enemies), and identification. Show examples of figureheads, and ask kids to think about what animals, mythological creatures/gods/goddesses, or heroes they would pick for inspirational figureheads on their own ships. After the discussion, kids can draw profile views of their figureheads in pencil and colored pencils. Depending on the group, they can then write sentences about or discuss aloud why they chose their figureheads, including the names of their ships. Display kids’ pieces in a group exhibition.